When a designer or an architect designs a chair, he is asked to go beyond the threshold of what has already been seen or already known. This is a quite arduous task but amazing and enchanting sinuous forms or daring combinations of innovative materials often leap out from their minds. But then comes production, and here things change. Changes are quite often required, which turn the project upside down and everything seems impossible. This is where we come in. The concept of quality has been a key value that we have made part of our work philosophy since the very beginning. And we work on it ceaselessly. And quality for us means viewing a project as a whole in order to make it simple and doable, without ever forgetting details, because it is through them that results can be measured, especially the hidden and intangible ones. And the latter ones are the those that are necessary for measuring our customer’s satisfaction. 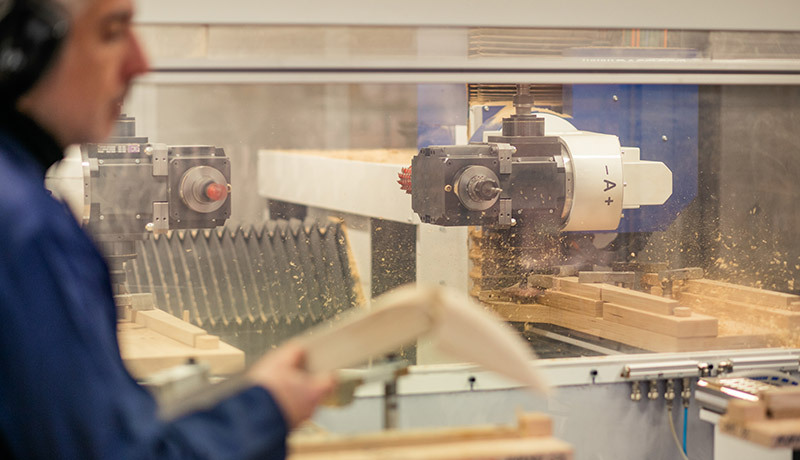 "Tangible" pathways and results of quality are certified by CATAS, the Italian Institute for certification, research and testing in the wood and furniture industry. For us people really do make the difference, we pay a great deal of attention to the aspect of training because we believe both in our work as well as in that of others. The forests in which we live, purify the air, protect biodiversity, provide the natural habitat for many species and also play a crucial role in mitigating the effects of climate change. In this regard, it is important to ensure that the wood products which have been purchased are marked by the FSC certification, which Tecnosedia has obtained in order to guarantee its customers the assurance of quality products that are in harmony with the environment. A cutting edge CNC milling machine shall be arriving in the coming months that able to deal with the most complex kinds of wood milling. Yet another step forward with a positive gaze towards the future, together with the acquisition of quality and technology, combined with the constructive versatility, in order to meet all of the technical needs of all of our customers who entrust themselves to Tecnosedia.